Rachael Ray, Barbara at Two Birdies and a B, and I have something in common. We have August birthdays. Actually, Barb and I share the same birthday on the 14th. 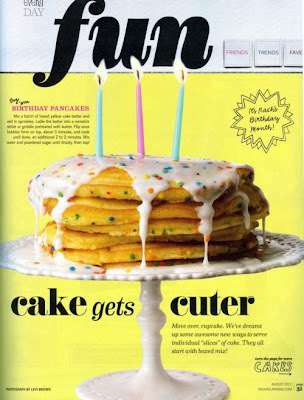 I love these Birthday Pancakes from the August 2011 Issue of Everyday with Rachel Ray. I make them each year for my birthday since Joe doesn't care for pancakes but will eat them with me on my birthday. When the frosting is ready to pour, start stacking the pancakes, drizzling each layer with frosting and sprinkles. Cover the top pancake with frosting and finish with sprinkles and a candle! Start singing, cut and serve! Add a scoop of ice cream if desired. I'm going to send this to my dd..Her 3 boys love pancakes..this would be so cute..Happy Bday for the 14th if you arent' posting that day!Enjoy~. Monique, these pancakes would be fun for the boys. It would be a nice tradition also. Thank you for the birthday wishes. ok...I have a birthday girl August 14...my little granddaughter Betty will be exactly 6! Well I wish I was turning six ;o) Happy Birthday to Betty! I love pancakes! Happy Birthday, Debbie. I'll be thinking of you. Hope Joe has something special planned to help you celebrate. You know my Joe ;o) Thanks Sarah! I made these last year and loved them!! Enjoy them on your b-day and have a wonderful celebration! Happy upcoming birthday, Debbie. I love this stack of birthday pancakes! 'm an Oct. girl and I'd like to have b'day pancakes for me to, lol.. Have a happy b'day week. I'll be happy to celebrate here with a stack of pancakes for your birthday in October. Marking my calendar now ;o) Thanks for the wishes Fabby!